An intriguing opportunity to develop a substantial shopping arcade immediately west of Dublin’s Grafton Street is expected to attract considerable interest from developers and investment groups when it goes for sale from today. 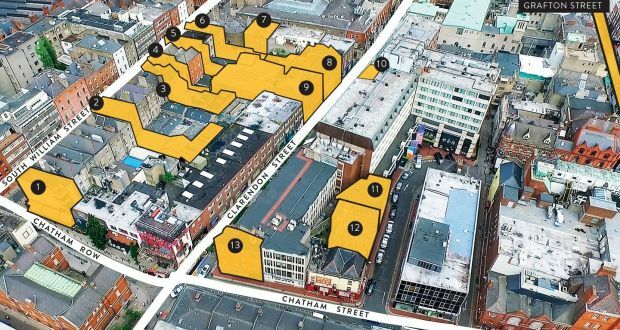 The extensive portfolio covering 18 commercial properties and 12 residential units was carefully assembled over a 10-year period by Bernard McNamara to facilitate the development of an upmarket shopping enclave between Clarendon Street and South William Street. The scheme was abandoned when Mr McNamara’s business failed and the bank loans were taken over by Nama. Agents Knight Frank have now been instructed by Marcus Bell of real estate advisers Duff & Phelps to sell the large mixture of retail, office, restaurant, bar and residential properties, all on the rapidly changing west side of Grafton Street. Ross Fogarty of Knight Frank is seeking in excess of €27m for the Madrid portfolio, the largest footprint to be offered for sale in the city centre since the nearby Victorian-style South City Markets were sold in 1992. Most of the current properties were bought off market by McNamara in the boom before the property crash and are now likely to be resold at a fraction of their original cost. Several other retail properties acquired by McNamara including two small shops on Grafton Street which were later amalgamated along with buildings on Suffolk Street, College Green and Chatham Street have already been sold off because they do not impinge on the proposed shopping mall. The original concept envisaged the development of at least 9,290 sq.m (100,000 sq.ft) of retail and commercial space on three levels and considerably more if two additional buildings on Clarendon Street and two more on South William Street are eventually included in the portfolio. To ensure its success, the proposed Clarendon Street shopping facility needs to be connected to Grafton Street through a series of pedestrian walks, the most important being a proposed ground floor link through the Westbury Hotel. For that reason, the Doyle family who own the hotel could have a central role in any future development. In the meantime, they may well opt to purchase Lot 2 in the sale, which includes 6-7 Balfe Street, 8-9 Balfe Street and 1 Westbury Mall, which, if redeveloped, would add another 50 bedrooms at the highly successful hotel. Lot 2 also includes 14a and14b Chatham Street. Duff & Phelps may well favour land swaps or joint ventures to consolidate the existing landholding. As things stand, Chatham Street, Harry Street and Johnson’s Court provide a direct links between Grafton Street and the site of the proposed development. Interested parties will obvious take note of the success of the South King Street retail development (Warehouse/ Zara/H&M) next to the Gaiety Theatre, which broadened the pitch of Grafton Street. Retail experts will argue that to fully establish a Grafton Street quarter, a greater area and more functional space needs to be created with a critical mass of retail that compliments and extends the Grafton Street offer. Knight Frank says that the recent reinvigoration of the Grafton Street area has triggered a significant increase in activity on good secondary streets including Chatham Street, South King Street, South William Street, Wicklow Street and Clarendon Street. The number of people visiting the city centre increased by 2.6 per cent from January 2014, and December 2015. However, when broken down, the highest recorded growth was on South William Street, which showed a 26.9 increase in footfall. The full portfolio going for sale has 26 tenants who occupy 7,131 sq.m ((76,756 sq.ft) of commercial buildings and 716 sq.m (7,706 sq.ft) of residential accommodation. The combined rent roll of €1.4m suggests that it is seriously under-rented at only €196 per sq.m (€18.24 per sq.ft).